STEPS IN THE RACE TO OUTER SPACE. 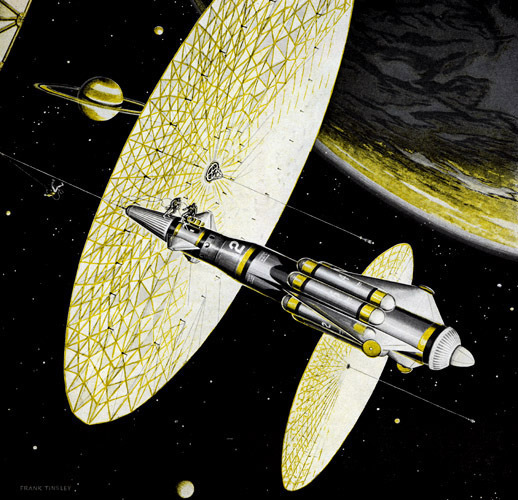 The large circular objects are Solar Wind Ships, capable of carrying astro- nauts on fuel-less journeys through the solar system, using the Sun's expanding flood of radiation—or "trade winds"—as a direct propulsive force. The trade winds are harnessed by sails of plastic film, coated with shiny evaporated aluminum. A flotilla of manned Solar Wind Ships is approaching Saturn. To the right is Titan, largest of Saturn's nine moons and the only satellite in the solar system known to have an atmos- phere. A crew of astronauts enters a small ferry-rocket, towed behind the Wind Ship. Since the Wind Ship cannot land on any planet, they will explore Titan in the Atomic-powered rocket, then rejoin the fleet for the remainder of the trip to Saturn.